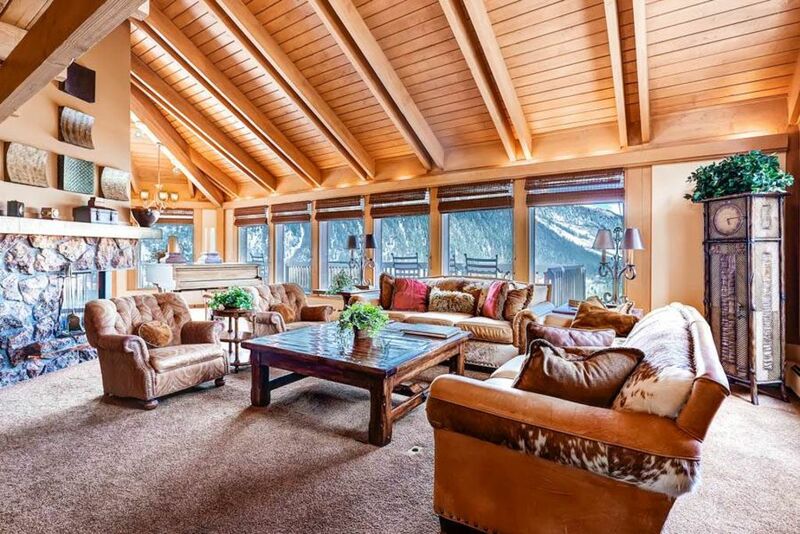 Mountain Valley Retreat is a spectacular 6 bedroom, 6 bathroom private home overlooking downtown Aspen from the east. This spacious mountain house features modern amenities encompassing approximately 5,000 square feet spread over 4 floors. It offers fantastic views and natural lighting throughout. The main level has floor to ceiling windows, a spacious wrap around deck with a barbecue grill and deck furniture, a dining room table for up to 12, an additional breakfast nook area that seats 4, a three-sided stone fireplace, a grand piano, a spacious living room with high ceilings, a large kitchen, and a dry and wet bar area. The property also offers numerous additional amenities including a hot tub, snowmelt driveway, a two car garage, laundry room, flat screen TVs, and wireless internet throughout. The master bedroom has a king bed, the second has two twins (can be made into a king upon request), the third has a king (two twins), the fourth has two twins (king), the fifth has a king (two twins), and the sixth has two twin bunk beds. There are bathrooms on all floors, an additional kitchenette on the lowest floor, and a washer and dryer. This home is wonderful for family get-togethers or groups of any kind with its flexible bedding arrangements and large common spaces for gatherings. Please note that parking is limited to 3-4 vehicles. However, for those not wanting to drive, there is a Dial-A-Ride service that will pick you up at the house and take you to town or will pick you up in downtown Aspen and return you to the house for $1/person fee (970.920.9999 for Mountain Valley Dial-A-Ride service). There is a full time caretakers unit associated with the home. Call us, and allow McCartney Property Management’s guest services to open the door to your Aspen experience! Pets allowed with a non-refundable pet fee. Really enjoyed this spot. The kitchen had everything we needed, and there was plenty of space for everyone to relax. The view of Aspen from the balcony was great. I should also mention that the staff at McCartney Property Management were fantastic; they answered all of our questions and were very easy to work with. Highly recommended! Thank you so much Chris for the review! We hope to see you again on your next visit to Aspen! This was a great place and your people was wonderful. We will be back. Thank you so much for your review David! We hope to see you again on your next visit to Aspen! The home has an excellent view of Aspen! However, is tired, aged and over priced. The pictures on line present a different picture than reality. The property management company does the best they can to make up for the issues and were helpful! Would never stay here again! Views, location fantastic. Structure old and not well kept up. The location is perfect- 5 mins from slopes. For a renter, there were no instructions for the use of any of the homes AV equipment or anything else- including when to take out trash or how to deal with dirty towels, etc. There was no obvious exhaust for the stove, resulting in a lot of "smoke" which the smoke detectors did not pick up- assuming they were working. There were a number of outside doors which could not be locked. It was not obvios that the garage could be used and even then someone's car was already parked inside. The open design allows any conversation or other noise to be heard from every single floor. Thanks for the review and bringing these things to our attention! We will look into the stove, and getting some instructions laid out around the house for guests. All doors do lock. I am sorry if you were having trouble with them. We are around 24/7 and wish you would have called to make your stay better. The house is great for accommodating a large group. We used every inch with 13 of us in town for a family wedding! The kitchen is updated, so it was great to cook and hang out in- plenty of dishes and glassware for a large group. The house is definitely "dated", but comfortable and a good value for Aspen for a large group. The view is spectacular and the deck was a great place to hang-out. There is no Air conditioning, so the upper levels were quite warm during the daytime. We did utilize the Aspen Dial a Ride, which was very handy for getting into town for $1/person. All in all a good stay and good value. There is a caretaker that lives on the property in a separate unit (that was a surprise for us). Thank you so much for staying with us during your family wedding! The Mountain Valley Retreat home is one of my favorite properties. AC is a rarity in Aspen due to the cool, Colorado, summer nights and the age of most of the buildings and homes. We do provide fans for your comfort. We disclose there is a full time caretakers unit associated with the home in all of our listings. At times it may become lost in the description. Thank you so much for the lovely review. All of you were wonderful guests! The location and view is stunning! While there are a few components of the house that are a little dated (master bedroom shower head, brown carpet everywhere) the layout of the house was perfect for our weekend wedding reception. The company was wonderful to work with and met every need, even checking in to be sure everything is going well. Would absolutely recommend this house for groups!